Olla arrived at my family home, shy, nervous, and worried. He was fearful of anything that moved and any large object. Having spent his life to date with his brother he now found himself with the responsibility of having to process the world around him and make his own decisions. He was out of his comfort zone and could no longer rely on being a follower. During the early days I questioned my own thought process in separating the dogs. I was worried that Olla couldn’t cope. Running water frightened him, logs, fallen trees, large boulders, rustling bags, trees blowing in the wind – all caused him stress and anxiety. He was unsure of people and he wasn’t sure about me. Other dogs unsettled him; aggressive dogs terrified him to the point he would scream, whilst nervous dogs brought out a reactive response. His world had changed drastically and his brother was no longer available to help him process this world or protect him from the things that worried him. I started to wonder whether it was right to allow a dog to live in such way. Should a dog have to experience daily fear, stress and anxiety? My options were limited; returning him to his former home and his brother was an option, but not the answer. This would possibly see him passed from home to home with potential owners being charmed by his impressive appearance, but probably failing to cope with his view on the world. I’m not afraid to admit that, several months in, I felt exasperated by his irrational fear and high levels of stress. It was time for me to consider whether I’d been defeated and accept the work of Mother Nature. An unwitting breeder had allowed these brothers to leave the litter together and be homed in the same family, with the family unaware of the potential pitfalls. Whilst there is limited scientific research on the side effects of raising litter mates together, dog experts generally accept it as a bad idea due to the different behavioural problems that can occur, which in some extreme cases can include fighting each other to the death. Not willing to admit defeat, I gathered my thoughts and focused on the positives. A change of diet was starting to yield results. 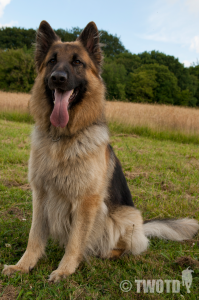 His coat was fantastic, his appearance healthy and he’d gained 10kg. 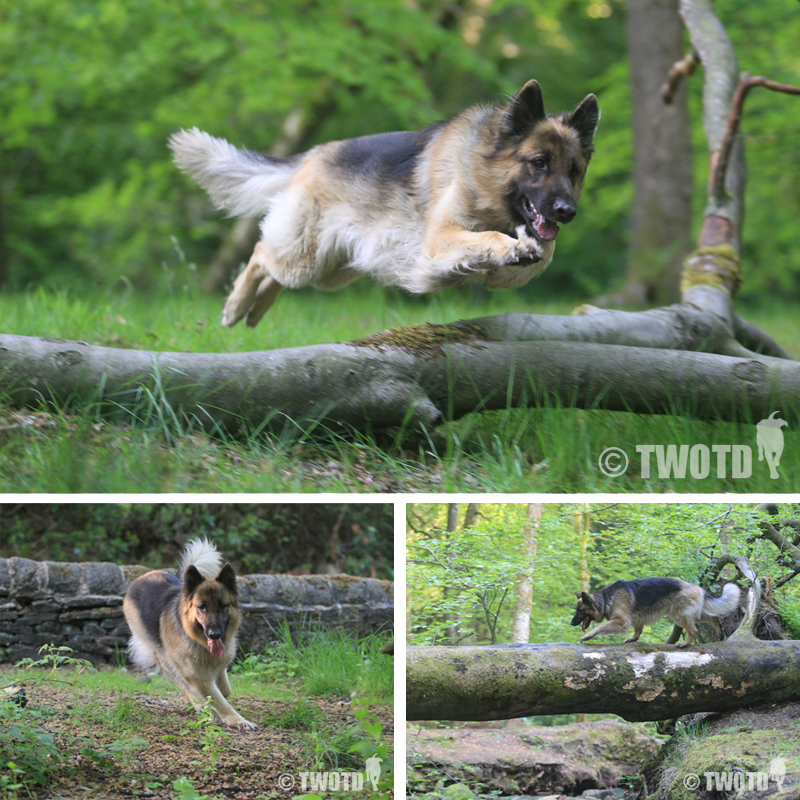 Obedience work was improving daily and heading towards competition standard; his agility was getting better as his body strength increased; search work kept him focused and happy with his big bushy tail swishing to and fro excitedly as he searched for the object. All in all he was making steady progress. I needed to stick with him and allow him time to make sense of his new world. I looked at all our hard work and the glimmers of hope now evident. My family had supported me through all and were becoming increasingly attached to Olla, but they understood the difficulty of the situation. Desensitisation and counter-conditioning had been effective and Olla was clambering upon felled tree trunks, jumping natural obstacles, and walking along raised surfaces, ready to receive praise and reward. The stream running through the woods where I exercise him was becoming a pleasant place for him to play and no longer something that caused him concern. His confidence and sense of security was growing on a daily basis. There was no way I could think of letting him go. Olla has been with us now for just over 7 months and has become very much part of my family and has grown in popularity in our local community. 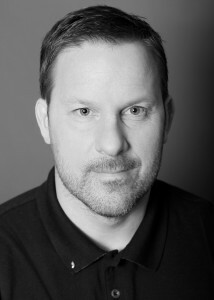 He is going from strength to strength with his ability to cope with unusual situations improving all the time. Fellow local dog walkers comment on how he has changed, and how the stressed and anxious look has turned into a happy, confident one. Only recently he attended his first training class as my working partner demonstrating exceptional obedience and outstanding behaviour. Due to his life experiences it will be necessary to manage Olla carefully for the rest of his days. He is a highly sensitive dog and is capable of exhibiting high levels of stress, or indeed demonstrating intense exuberance. For now he knows where he is at and is comfortable with his routine and his position. I would not choose to be without him. During our time we have built a strong and secure bond and it’s great to see Olla confidently negotiating his world. I’m a big believer that being a dog owner can be good for your health. And there’s an increasing amount of evidence to prove it too. Feel better. Interacting with your dog, meeting their gaze and engaging in gentle play can help lower blood pressure and anxiety. It’s been shown that taking well trained dogs to care homes for the elderly or special schools for children with disabilities has a calming and positive effect. Meet your neighbours. Dogs make great talking points. You are rarely lonely with a dog. When you are out and about with a well behaved dog you have a natural conversation starter. Walk the walk. 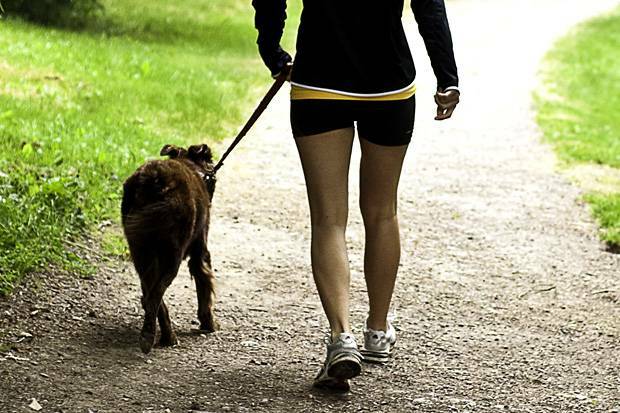 Getting out and about puts exercise at the heart of your day – which in turn is good for your heart. The British Heart Foundation tell us that daily exercise strengthens our hearts, lowers blood sugar and cholesterol, and aids restful sleep and a good memory. Feel young (again). 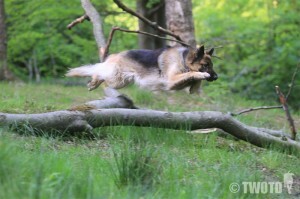 Dogs like play, they like fun and they don’t mind if you look daft (which is great as I often do!). Dogs make it ok to be silly, and this can help us de-stress and unwind. We’re all so busy and life is often difficult; sometimes it feels wonderful to make those crazy faces, lie on the floor and giggle, and live in the moment. Your dog will love you for it too. The motto of the British Police and Services Canine Association is ‘Canium Auxilio Servimus’ which means ‘with the help of dogs we serve’. Service personnel and Police have known the value and contribution of service dogs for decades. In the First World War tens of thousands of dogs were used to deliver vital messages. In the Second World War service dogs were deployed in a whole range of ways from acting as scouts, guards and trackers, to helping drag injured soldiers to safety. Even in 21st century conflict our service men and women have dogs by their sides. 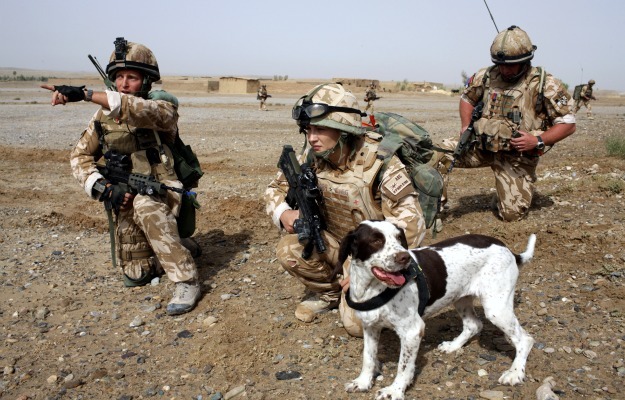 Did you know that dogs are currently supporting our troops on the frontline in Afghanistan? The dogs in the Military Working Dog Unit are involved in searches, patrols and IED detection. The British base in Afghanistan, Camp Bastion, includes a state of the art dog training centre. There, service dogs continue their training to become accustomed to the extraordinary noises of helicopters, gunfire and explosions. Like their handlers they too have specific equipment to help keep them comfortable in the climate, including canine hydration packs and air-conditioned and heated shelters. When I think of our troops in Afghanistan and elsewhere, I also consider the dogs that help them to serve, and hope they all return safely. 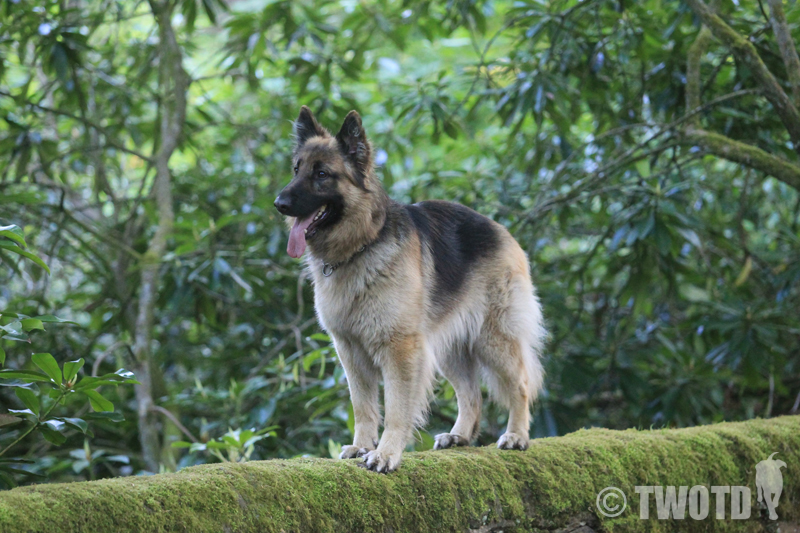 The UK has a dog population of around 8 million. That’s a lot of dogs, and as a result, a heck of a lot of dog poop. Like many dog owners (and the majority of the population who are not dog owners) I am constantly frustrated at the behaviour of irresponsible owners. I see ‘scooping the poop’ as the responsibility that comes with owning a dog and being part of my local community. It’s as simple as that. Dog owners who don’t clean up after dogs really do damage the reputation of the rest of us. 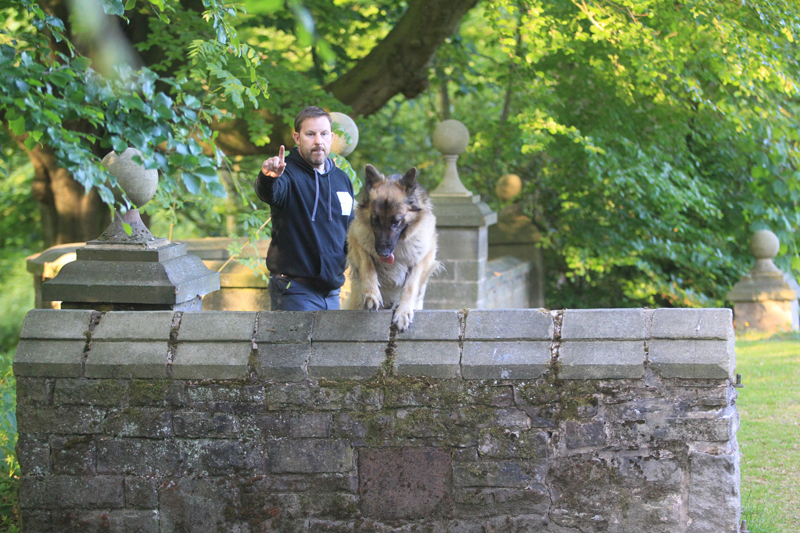 The problem with dog fouling has risen for the first time in 10 years, according to the Local Environmental Quality Survey of England. So what can we do? The Dogs Trust and Keep Britain Tidy, have joined together with TV personality Ben Fogle to launch a great new campaign, ‘The Big Scoop’. I’m proud to support it and help spread the word. 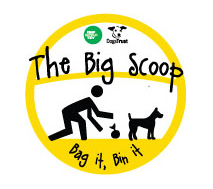 ‘The Big Scoop’ raises awareness that dog mess bags can go into any bin if there’s no dog bin available. And reminds irresponsible owners that hanging bags on fences or trees is not acceptable! It’s a worthwhile campaign. The rest is up to us. Leading by example, and offering a spare bag to a fellow dog owner feels like a good start. Let me know what you think.